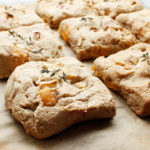 If you’re preparing these Easy Apple Cheddar Herb Biscuits for a family gathering, you might want to bake two batches. They are simple to prepare and include a perfect blend of flavours—especially for the holiday season! The best biscuits to make for guests as they meet so many dietary preferences. They’re gluten-free, vegan, plant-based, yeast-free, egg-free, dairy-free—and completely allergen-friendly! Line a baking sheet or baking stone with unbleached parchment paper. Mix in buttery spread until well incorporated. Gently fold in herbs, cheddar cheese, and apples and mix. Transfer dough to the parchment lined baking stone and spread it into a rectangular shape, approx. 8.5 x 9 inches. Tip: rub your fingers with a little coconut oil to prevent sticking. With a large flat blade kitchen knife score dough into 9 pieces. Then with the help of a little straight edge spatula separate each piece by half an inch. Sprinkle with a few grains of sea salt, top with a little stem of fresh thyme and a couple of pieces of apple. Enjoy with your favourite buttery spread or jam! Store any leftovers on the counter wrapped in a clean tea towel for one day and then refrigerate in a sealed container for up to five days. Warm up or toast to eat once refrigerated. For a healthier alternative you can omit the buttery vegan spread and vegan cheese. Baking these biscuits with just the apples and herbs will be as good! And yes, if you’re not dairy free but avoid other top allergens go ahead and use regular butter and cheddar cheese for these biscuits. ** Make sure to use corn-free, gluten-free, and aluminum-free baking powder. *** Not sure if 1/2 cup of water is enough, it might be best to test with 1/2 cup + 2 tablespoons of water. That way your dough won’t be too wet for your first try. If you make the recipe often, you will get better at judging the amount of water required. If your dough mixture looks too dry then, by all means, add the extra 1/4 cup of water. Your dough should be thick and smooth but not runny like pancake batter and not dry and crumbly. I almost always include the whole 3/4 cup of water. To measure your flours, I suggest scooping it out with a spoon from the jar or flour bag into the measuring cup. Never pack them in. Or gently dump the flour from your glass jar or flour bag into measuring cup. Substitutions — Plant-based milk: You can try other types of plant-based milk. I did not test any other milk substitutions. It is recommended to use 2-ingredient plant-based kinds of milk (water + seed/nut). You can try with store-bought brands, but they often include thickening agents and other unwanted ingredients. Psyllium husk: If you can’t eat or don’t like using psyllium husk, you could try just leaving it out or replacing it with flax seeds or chia seeds or a combo of both. Ground flax seeds and chia seeds are probably best. Allergen notice: Make sure that all your ingredients are labelled gluten-free, egg-free, dairy-free, and free of any other top allergens you or your family avoids.